Paul Levine is the author of the Jake Lassiter and Solomon vs. Lord legal thriller series. While the two series are separate, the characters do work together in the last few books. Jake Lassiter, Steve Solomon and Victoria Lord are now friends so they meet and work together (and even save each other) at some point. I have to admit that I’m very late in starting these series. 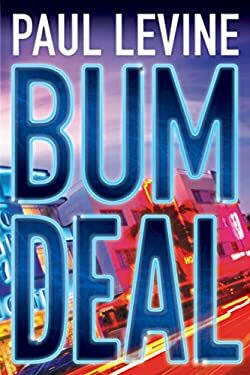 I’ve just finished reading Bum Luck, the latest book in the Jake Lassiter series and I’m hooked. I’m going back now to read all the books in order, because they’re that good. Jake Lassiter is a former second-string linebacker who turned to practicing law with his own ideas about what justice should be. Steve and Victoria are partners, not only in business, but also in life. Oh and Jake has a crush on Victoria, which makes for some interesting moments. Here are two Paul Levine books in order for his two legal thriller (and sometimes quite amusing) series. Paul Levine (website) was born in 1948 in Williamsport, Pennsylvania. While studying at the Pennsylvania State University he was editor in chief of the newspaper The Daily Collegian. He graduated in 1969, after which he enrolled at the University of Miami, from where he got his J.D. in 1973. After finishing his studies, Paul Levine became a trial lawyer, during which time he was made a partner at Morgan, Lewis & Bockius. He also worked as a legal TV commentator. His books have been translated in over 20 languages. Paul Levine won the John D. MacDonald fiction award and he was nominated for several other awards, including the Edgar, Macavity, International Thriller, and James Thurber prizes. Paul Levine also wrote 21 episodes for “JAG”, a popular CBS military drama series. Today he is working as a full-time author, writing his next Jake Lassiter story in his home in Los Angeles.